“I think I’ll have to buy this,” I said to my son, holding out The Complete Journals of L.M. Montgomery. “Of course you will,” he said, knowing how many books by and about Montgomery line the bookshelves at home. I had already read all five volumes of her Selected Journals, compiled by the same editors, Mary Henley Rubio and Elizabeth Waterston. 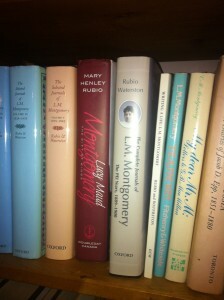 The entries in those earlier volumes were selected to emphasize Montgomery’s life as a writer, omitting many entries describing her moods, her everyday activities, and her favorite landscapes. Yet, even though many journal entries don’t relate directly to the development of her writing career, they often feel as if she is practicing. She may have simply been trying to express her enchantment with a beautiful scene, but she does it in what seems like a consciously literary way, in sentences like these: “The sea was an expanse of silvery gray. Afar I saw the purple slopes of New London scarfed in silvery hazes” (p. 24, entry for Thursday, April 10, 1890). Montgomery started a journal to record what she thought worth recording. It became a place where she could vent her feelings and say things she couldn’t say anywhere else. But the practice of writing a journal was, for her, also an important part of the discipline of writing. This entry was posted on Friday, October 5th, 2012 at 9:00 pm	and is filed under Books. You can follow any responses to this entry through the RSS 2.0 feed. You can leave a response, or trackback from your own site.